This post is brought to you by A Healthy Slice of Life partner. I’ve occasionally gotten odd looks when I proclaim my love for healthy food. It’s true that “eating clean” makes me feel good, but I also genuinely love the way real food tastes. I was trying to think back to the time I first decided how delicious vegetables can be and realized I really owe a lot to my mom. In healthy eating and lots of other things, mom knows best! She cooked almost every night while I was growing up and made good food taste good. Her herbed broccoli is still one of my favorites, she made Hollandaise for steamed artichokes, and she made a killer spinach salad. My mom has it down, but for me, once I was out on my own, it took some trial and error in the kitchen to prove that healthy food can taste really good. I don’t choke down vegetables, I actually prefer them, and over the years I’ve come up with my favorite ways to stay eating healthy by making real food taste amazing! Use the spice drawer. I was slow to experiment with different spices because I was intimidated. Now I’m willing to be a bit more creative. I’ve tasted the warmth and flavor that cumin or turmeric can bring to a dish. I’ve noticed the punch that dried mustard can add. Salt and garlic powder will probably always rank supreme to me, but branching out with spices (especially when I can buy them in small quantities from bulk bins) makes a huge difference. Also, vinegar is a great way to add a lot of flavor with a small splash too! Use strong cheeses. I love the power of cheese. Blue cheese crumbles, a schmear of herbed goat cheese, grated Parmesan. They all add excitement to what might otherwise be a simple salad or lackluster bowl of pasta (or zoodles!). With only a minimal amount, it creates a lot of flavor for a relatively low calorie and monetary cost. Cook with alternative liquids. Olive oil is a staple for a reason, but experimenting with broths, wine, or a more flavorful oil, like sesame oil has really livened up my meals. I also cook my grains in broth instead of water for added nutrition and flavor. Marinate meats. For the amount of time recommended. I really don’t believe a 20 minute marinade does much, but a few hours and sometimes overnight? That boring chicken is going to taste GOOD! Pro tip: use an acidic ingredient in the marinade, like citrus or vinegar, to help tenderize the meat. Roast all the veggies. I’m serious. Every single one of them. My method is simple: a spray of avocado oil, a sprinkle of salt and garlic powder, and roast at 375/400 degrees until done to my liking. It can be 20 minutes for broccoli or closer to 45 for potatoes, but roasting is the way to go for maximum flavor! For an added zing, squeeze a little lemon over roasted vegetables, or sprinkle with a bit of freshly grated Parmesan. We’re talking next level here! Buy fresh herbs each week. Or grow them. Fresh herbs (along with strong cheese) is one of those things that took me a long time to get behind. I saw it as increasing my cost, for little reward, but now I know better. Fresh herbs pack a lot of flavor and perhaps even more importantly, they make food look pretty. I’m a believer that we first eat with our eyes and a little sprinkle of green certainly jazzes up a plate. Choose local/in season when possible. I’m working on doing better at this (I’ve been talking to a CSA I want to join!) because fresh fruits and veggies really do taste completely different than their grocery store counterparts. Just like my taste buds rejoice at the first bite of an in-season tomato, I’d like to do better with following suit year-round. Maximize the nutrients in my cravings. If you’re craving that chocolate brownie, my view is go eat a chocolate brownie. And make it an ooey gooey delicious one. However, if you need a little chocolate everyday, make the habit work for you. For example, Adora Calcium Supplements are non-GMO and 2 delicious servings (oh twist my arm, I have to eat two?!) contain 100% of your daily recommended calcium. The decadent discs are made from organic dark chocolate from Rain Forest Alliance Certified cocoa. If it’s been a particularly trying day, go ahead and scoop a little peanut butter on it. Take that Reese’s. If salt is your thing (me me me me me) use a crunchy tortilla chip to scoop us some hummus or guacamole or snag a few delicious salty olives. For me, it’s getting the most nutrient bang for my bite. Toast your nuts. (and all the school boys giggle) Toasting pine nuts or walnuts can add a satisfying and flavorful crunch to salads, oatmeal, and even pasta. Like a strong cheese, a little can go a long way and make a big difference. My friends at Adora are giving one of you TWO bags of Adora Calcium Chocolate Discs (your choice of milk or dark chocolate) and I’m throwing in a $25 Visa Gift Card so you can snag some new items at the grocery store to spice up your meals. To enter: simply leave a comment sharing a tip you have to make healthy food taste delicious! I will announce a winner on Friday, February 17. Bon appetit! I am a big fan of adding veggies in omlets and using feta! Delicious! I find it helpful to vary my method for cooking meat such as grilling, crockpot, broiling, blackened in the cast iron pan, sautéed, etc. Variety is key in keeping my head in the game with healthy eating! I agree with roasting vegetables. It takes the flavor to a whole new level! My tip is to use (healthy) condiments wisely!! Steamed broccoli tastes great dipped in some Dijon mustard, and raw carrots are delicious in tzatziki! I love using various ways of cooking. Keeps things new and exciting! And ROASTING vegetables is the only way to go! I agree with roasting all the vegetables! My husband thought he didn’t like many vegetables until I started roasting them for him. Steamed veggies just don’t taste good! And my toddler loves anything dipped. I can give him almost anything and he’ll at least try it if there’s something to dip it in! I think switching up what healthy foods we eat helps us to keep our meals from becoming mundane. I love to do salads and add a veggie the kids haven’t tried yet, like diced roasted beets, they never know until their plates are clean! Taking a few extra minutes to make homemade sauces (BBQ, stir fry, etc) really adds a lot of flavor! This post speaks to me! I cook everyday and try to keep it healthy and already do alot of the things you said. Love! Ps- still havent found adora in charlotte! Where did you get that big bag?! Im dying to try some! Agree on the roasting veggies! That was something my family didn’t do growing up but I’ve found can make me eat a ton of veggies! Also spending the time to find good recipes for dishes. A good recipe that has clearly been tested lots can make a huge difference. I almost always have luck with the americas test kitchen recipes, and I love their healthy family favorites book for healthy meals. I’m also a huuuge fan of roasting veggies. I started out using just salt, pepper and olive oil which is classic but lately I’ve been using Trader Joe’s 21 Seasoning Salute, so yummy on potatoes and broccoli! My mom made vegetables every day too when I was growing up too–great habits to start and I still prefer vegetables if given a choice of fruit, meat, or vegetables! I too prefer mine roasted and crunchy. I need to experiment more with the spices. I tend to go directly to salt, garlic, and lemon. I like to use the coconut oil when cooking . Subbing out other oils for this has been one small step I I’ve tried when it comes to healthier eating . Love all these great tips and reminders. Banana/berries and spinach in pancakes and smoothies. Also love goat cheese and seeds/nuts in salads. Hidden veggies in pasta. So many ways to spice things up and make food healthy! “Like mother, like daughter”. You are wise to have learned from your Mother who knows how to make tasty and healthy food. Ahh, tradition. May your girls continue in that vein. Try, try again. I’m beginning to appreciate that every time I try a recipe, I get better at it and it tastes better. I tend to be intimidated by experimenting. Come teach me! 😉 but I do enjoy making smoothies and experimenting with different fruits and adding in kale or spinach for extras. My daughter is hooked! This is a boring tip, but for me I need to follow the recipe. Anytime I try and take matters into my own hands and wing it, it’s a disaster!!! It tastes better when I follow the plan!!! I like to marinade chicken with lemon juice & fresh herbs from my garden. I marinade flank steak all day with soy sauce and olive oil. I use nut butters with lots of fruits and oatmeal. I get plain Greek yogurt and add PB to it. Or vanilla, local honey & my own GF granola. I too am trying new oils nowadays! Loved your post, it had so many helpful tips and the sponsored content was nicely presented. I did get confused while reading some sentences, because of the typos – there were more than usual today. I would add to buy organic. Could be just my bias (having worked on organic farms) but I think organic produce tastes better. Thank you for the heads up about the typos! I always read more than once but somehow I missed several. Note to self: no more late night editing. I also appreciate the feedback on the sponsored content. I’m always looking to improve how I present it. PS- the CSA I think I’m going to join is local and organic, which I am psyched about. I generally think organic tastes better too! I add spinach to my smoothie! I’m a big fan of bulking up traditional recipes with extra veggies- spinach and cauliflower florets are great options since they work in pretty much everything! I agree with roasting all veggies!! My favorite is to sauté zucchini with a little olive oil, parmesan cheese and spices. So good!! I love making smoothies! My little boy loves them too. It’s a simple way to combine fruits and veggies and make them tasty and fun. I love your carrot idea! I sneak veggies in to everything. Chopped greens in spaghetti sauce, grated kolrobi in salsa, etc. Also, garlic. All the garlic. I’ve just recently started roasting vegetables. They’re delicious that way. I find various things to dip my food in to pack the flavor! My favorites include dipping veggies in marinara, roasted sweet potato “fries” in ketchup or BBQ sauces, etc! I like cooking meat and veggies on the grill, it gives it a great flavor! Like you, I am all about roasting veggies!!! I am also with you in the roasting veggies!!! Salt, lemon pepper and a spritz of olive oil makes any veggie taste delicious!!! Yes, yes, yes to roasting veggies! So good and my kids will gobble them up! I have made brownies with black beans and I have made brownies with avocado and my family knows nothing (insert evil mom laugh here!). We freeze grapes in the summer and my kids will eat them like candy! And we make our own popsicles from fruit we juiced at home. I am a huge fan to adding lemon + parmesan or bacon (homemade thanks to my husband) to almost all of our roasted veggies. I never liked vegetables as a child so to me, if this makes them delicious and gets me (and my kids) to eat them then that’s fine by me! 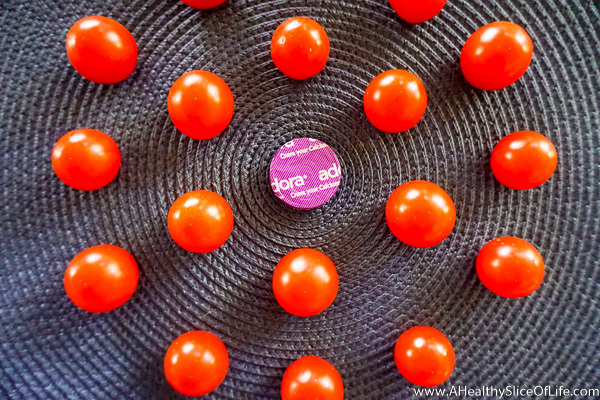 A spoonful of sugar helps the medicine go down, as M Poppins would say 🙂 And I LOVE Adora discs, and haven’t had them in a while, I’ve been meaning to pick some up! I love roasting, too! I put whatever veggie I’m making into a giant Ziplock bag with salt, pepper, garlic powder, and other herbs depending on the veggie such as dried oregano, dried basil, crushed red pepper, etc. Toss with olive oil and roast. Easy, simple, and so delicious. My 3 year old prefers roasted veggies hands down to “juicy” ones (aka steamed or sauteed, haha). 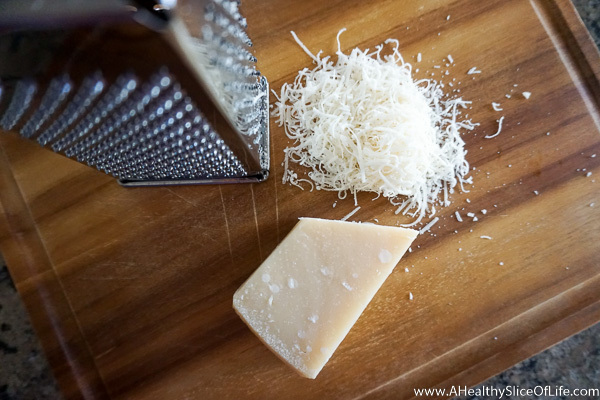 I always have a wedge of Parmesan at home because nothing beats freshly grated Parm.. the stuff you buy in packages tastes nothing like fresh! I sprinkle it over my whole grain pastas, roasted veggies, grain bowls, etc.. a perfect accompaniment to healthy meals! Totally agree with roasting veggies! Steamed mushy veggies are gross, I get why people think that! Roasted broccoli with garlic and salt. Love! Add a Tbs of cream cheese to the roasted broccoli and my kids said they’d rather eat that than dessert! I love to add lots of herbs and spices to everything to make them taste great and I love to plate it pretty so it looks more appealing! I love roasting veggies! It makes anything taste amazing!! We’ve figured out if we grill vegetables, my kids will eat anything. They love corn on the cob and squash from the grill, but won’t touch them cooked any other way. I like adding veggies to an omelet or even just sautéing them as I scramble an egg. And of course, adding cheese is what takes the cake for me! I’m with you, roasting is everything for veggies. I have also found that hummus always makes healthy food more exciting. Raw veggies, chicken, shrimp…all better with a little hummus on top! I roast all the veggies! My kids also enjoy a family style veggie tray during dinner with a dip of some sort of dip. They love the control of choosing what they like. I love roasting diced mushrooms, carrots, onions, and peppers the night before to add a veggie boost to jarred spaghetti sauce on busy nights after school. Loved this post! I am 23 and recently graduated from college, out in the real world for the first time. I finally have some spending money for healthy meals besides just brown rice, frozen veggies, and chicken ha! I would love a post on how your cooking/eating habits changed post college and how you managed it on a budget. I agree with strong cheeses! It just seems decadent to add a pinch or two of cheese to a meal. What a great post with lots of delicious ideas to try! Like others, I use green smoothies to get my greens in early in the day, and share with my daughter so it works for both of us! Thanks for running the giveaway! Future post idea: I’m really struggling with workout motivation. I have a little one at home. I’m debating about getting a Bob to start running. But not sure it’s worth the cost for a big piece of equipment if I’ve only run twice in the past month. Any ideas or tips for SAHM needing motivation and ideas for working out? I’ll look through your archives too, in case I’ve forgotten you did post about this already. Thanks for listening! I am a fan of roasting vegetables!! I have been on such a roasted brussel sprouts kick lately!! EVOO and salt and BAM they are amazing!!! I also thinking spices help and letting the natural flavors of the vegetables etc shine through!! YUM!!! Love experimenting with spices! The toughest part for me is not going overboard with the spices – I still want to taste and appreciate the veggie flavor! I love to add kale or spinach to a banana smoothie. Roasting veggies always wins, too! You recently got me hooked on Adora, so I’m very excited for this. I commit to healthy cooking via meal planning. That way, I can endure that I both eat a variety of fruits and veggies and that I get to them before they go bad. I also always have quinoa, frozen veggies, and tahini on hand to throw together a quick meal if our fridge is empty! I try to buy fruits and veggies in season! That helps. I can’t wait for tomato season again. I don’t crave salads in the winter. Spices and condiments are my jam! I steam frozen veggies with broth, add spinach, spices like chili powder and cumin with other stir fry ingredients, drain out some of the broth, and then add ALLLLL the sauces. Fish sauce, hot sauce, curry paste or corriander chutney = seriously crave-worthy. What can I say, I’m a spicyyy lady. I sneak veggies in where I can to help the whole family, including my 2.5 year old. I can throw veggies into smoothies, pasta, and on pizza and she will eat them up. If they were on her plate separate she wouldn’t touch most of them. I puree veggies and add them to any “saucy” thing I am making…ground beef/ground turkey tacos, meatloaf, chicken casseroles all get a tremendous amount of flavor when I pulse carrots, onion, peppers, and zucchini (or any other veggie “scraps” I have in the fridge) in a blender and add them to the mix. Bonus, the kids have no idea how many veggies they are eating. We love to mix it up with (healthy) recipes from different cuisines! Although roasted chicken, veggies, and potatoes or spaghetti and meatballs are always easy staples, they can feel repetitive to me. 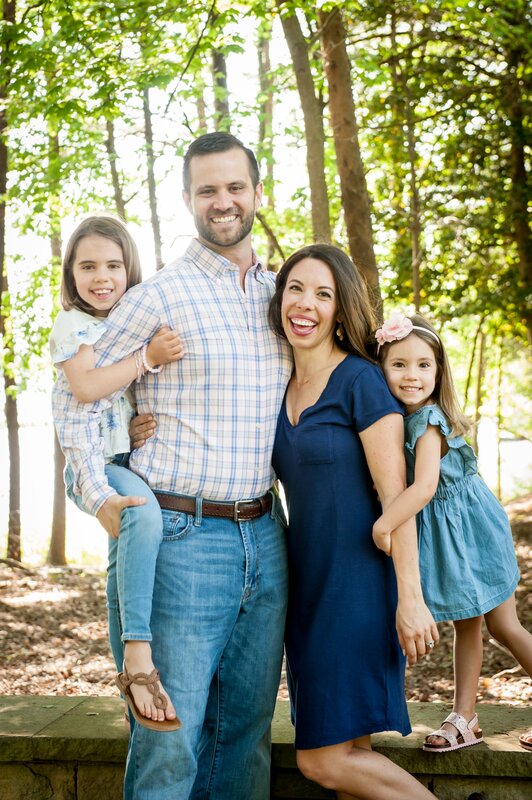 My husband’s family is from Taiwan so he cooks a lot of dishes he learned from his mom, but we also love to find new recipes inspired by Thai, Indian, Mexican, or Moroccan cuisines, just to name a few! It’s a great way to try new ingredients and incorporate seldom used ingredients to get a more varied diet and it introduces my little one to new flavors! I like to add vanilla and/ or cinnamon to my oatmeal- makes it taste sweeter without adding sugar. Adding veggies, ginger, and turmeric to a smoothie! I also could not agree more with roasting all of the veggies – my favorite lately is cauliflower, so good. I’m totally w/ you on the roasted veggies! Yum! I also always substitute applesauce for oil in baked goods. Not only is it WAY healthier, but also makes the end result moister (there’s that word!). I love to mix my yogurt- 1/2 plain greek yogurt with 1/2 a container of fruit greek yogurt. You still get tons of flavor but cut the sugar in half! I’m all about choosing the healthier way to get a craving in. Also spice is always my go to! As in hot and spicy! I really do put Frank’s Red Hot sauce on EVERYTHING. It always makes food taste better. To make healthy food delicious, I mix textures and flavor profiles. Something crunchy with something smooth, something spicy with something creamy and cool, something rich with some acidity… you don’t need a lot of the heavy stuff, just enough to add interest! I’m with you on roasting the vegetables. I literally crave them. I need to do better experimenting with oils other than olive. Good ideas here for sure! I’m not a fancy cook, but I am also a huge believer in roasting vegetables. And I love garlic salt!! I’m all about roasting veggies too!! I also love to add spinach to smoothies. The smoothie is still delicious and you’re getting extra greens in! I just recently started using fennel and I was surprised how yummy it is! I always just assumed it was a bland vegetable, but it actually has a very subtle licorice type flavor. I’m someone who can’t have too many acidic foods at once like garlic and onions, so fennel has been my new substitute! I throw it with scrambled eggs and frittatas, and it’s also perfect in a stirfry, or even to roast with chicken and veggies! I agree to roasting all the veggies!!! Also love making coconut oil chocolate! Coconut oil, cocoa powder, and maple syrup. Mmm!! Thanks for a great post! I need to try those calcium chocolates. I love to roast ALL of the veggies! halfway through I will toss some chopped up shallot on top to add even more flavor. I basically live off of roasted veggies on some rice, with franks and hummus on top…my weeknight dinners. Agree with all of your tips! I would have to say that almost every point that you make on here, I do! One thing that I have been adding is sauteed, fresh veggies. While roasted is really good, there is just something about that little crunch and sesame oil to turn up the flavor! I am like you and lovvvvee veggies. To make the rest of my household feel the same, I try to be creative with spices and sauces. My husband and son love a good dipping sauce. If that is what it takes, I do it! I definitely follow the advice that if you craving something then you indulge (to a point). This makes it feel like nothing is off limits & eating *healthy* is not a punishment! I like making healthy food look “pretty” on the plate, it makes eating it more fun and my 2 year old also enjoys it more too! I love roasting veggies and using feta cheese…yum! Fresh herbs! I put fresh basil and parsley on a lot of things. 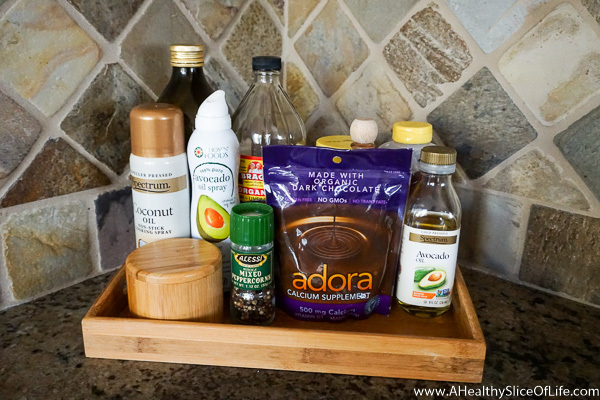 And, I love a little drizzle of balsamic vinegar on roasted veggies, salads or slices of fresh tomatoes. I agree with roasting veggies!!! Best flavor. I also love making healthy swaps such as cauliflower rice and zoodles. I’m with you on a lot of these tips! I love roasting veggies with olive oil, salt, pepper, and garlic. Then a sprinkle of parmesan cheese when they are done. Tastes great with pretty much any vegetable or potato! Soup. You can throw all kinds of veggies into a soup. Eg tomato soup, potato soup, chili, beef veggie soup. It’s surprising how much you can incorporate into a soup that you purée at the end. Coconut oil goes a long way in just about everything. I do all the things you listed in this post! I also frequently throw extra vegetables into recipes. Things like soups turn out just as well if I add an extra carrot or two and maybe some chopped greens. It adds some extra nutrition and helps to bulk up the meal a bit too. With kids, try different ways of serving a healthy food (i.e. different cooking/prep methods) until you find what works. spices! I have a cabinet full of different spices to make my food taste great. We love to grill veggies and I always throw in kale, spinach, or avocado to a smoothie! Grill or Roast them. I add either Garlic or Onion Powder to any and all veggies to get it a boost! Or Nutritional Yeast! I have found adding spices to pretty much make most things taste good too. Spice!! I love heat, so Franks Red Hot, Siracha or Wasabi take blah to OH YUM!!! Definitely healthy oils and spices. When I was calorie focused I would roast my veggies with nothing on them. a little oil goes a LONG way! Slow cooker!! Putting spaghetti squash in whole and then 4 hours later on high you have easy to scoop out noodles! I roast vegetables to help them maintain the maximum amount of flavor. I will often make a sauce to dip them in using Greek yogurt and avocado to make them a little more fun to eat. Roasting veggies or olive oil and seasoning are my go to methods. I use chickpeas and edamame in salads with a few scoops of hummus as my dressing so good! Also use chickpeas and beans for healthy cookie dough bars and brownies! I’m a fan of nutritional yeast and add it to all kinds of meals! I make homemade sauces and condiments! Fresh salsa, anywhere from Mild to the Hot variety, is an easy way to amp up flavor to any dish without adding a lot of calories or extra work. I put it on my eggs in the morning, on a rice bowls for lunch or dinner and it also great on those roasted veggies. I add hummus to veggies and potatoes, even on top of salmon or chicken to give it extra taste and flavor. And I agree on roasting all vegs! Love, love, love clean eating! I find it helpful to always have chopped veges and fresh fruits ready to eat in my fridge. A little prep helps in a big way. And I agree, spices are your best friend when it comes to roasting veges. The take it to the next level! A dab (or 3) of sriracha sauce does wonders! My tip is to own up to what you like and stop trying to force things you don’t. Everyone always says to roast vegetables – but I really hate that texture but love steaming vegetables. So, if something that “should” work doesn’t – find your own way. Roasting makes veggie delicious! I also like to season with garlic, ginger and herbs. I love adding fresh garlic to dishes to give it more flavor! I also try to sneak in extra veggies and fruit into dishes for my toddler. Roasting veggies and green smoothies are my go-tos! Lots of butter and some sea salt!!! I love a bowl of cereal occasionally but the yummy sugary ones are not so healthy so I’ll use a base of healthy whole grain cereal and then top with a smaller amount of one or two “fun cereals/granolas”. I find the different textures more satisfying as well. This can work for kids too where you pick the healthy base and then they should the fun topping cereals. 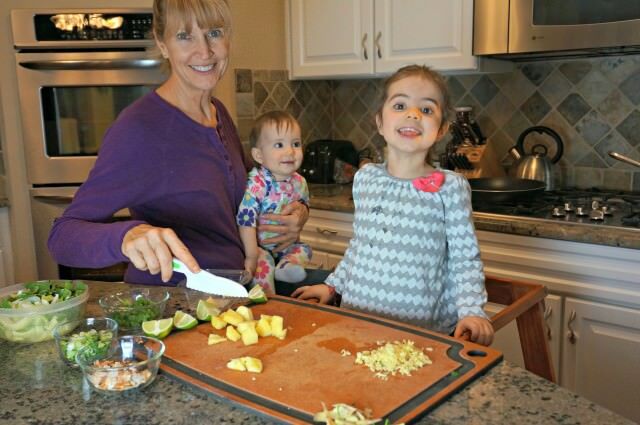 Making healthy food taste good is a challenge for every parent. Isn’t it! 😄 Thanks for coming up with such great ideas to make it happen! You know ever since I started reading your blog our eating habits have changed drastically, for the good that is. We can’t really afford very organic stuff here, but we try to ensure that we get lots of nutrients for every food we eat. Love it!! I love roasting veggies too as they add so much flavor. 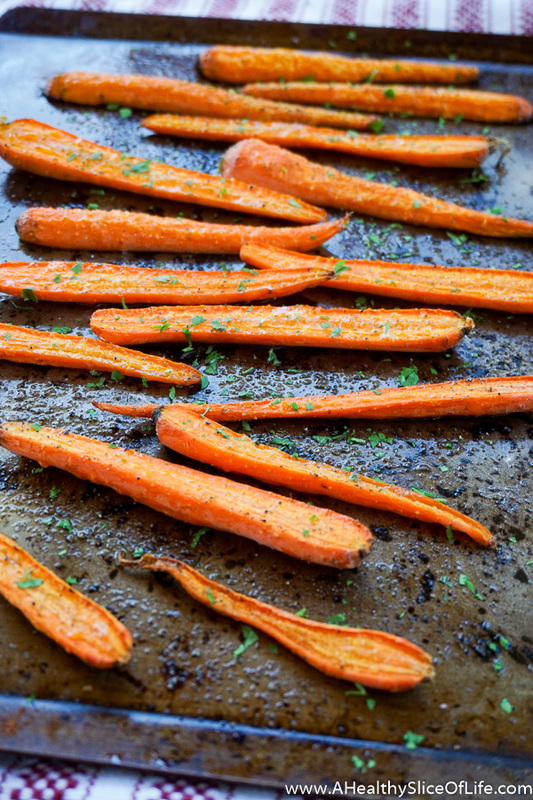 I also love roasting sweet potatoes and adding herbs to them. Totally agree about fresh herbs! I highly recommend growing them at home. You’ll save $$ and you won’t get stuck with extra in your fridge. I hate buying a whole bunch of parsley, using 1/3, and then having to toss the rest. I’ve had horrible luck with flowers/vegetables (thinking back to your gardening posts! ), but herbs are so SO easy to grow. If I can’t mess them up, anyone can grow them! My almost 5 year old and 2 year old love helping me spiralize veggies. It’s amazing how different a vegetable tastes once it’s spiralized. Our current favorites are zucchini sautéed on the stovetop or sweet potatoes and russet potatoes spiralized and roasted in the oven into crispy “fries”. Spiralized cucumbers are also popular at our house. Proper cooking times. Yeah i’m really bad at this but it can turn chicken from super moist and flavorful to dry and hard, sweet potato fries from soggy to crispy, and so on. Once you find how long and what temperature (food safety, use a thermometer! )- it changes the game! love your tips too! so practical! I love roasting veggies, too! I also like to chop veggies up on Sunday during my food prep so I have healthy options that I can easily grab throughout the week. A lot of times, I’ll mix a bunch of chopped veggies and protein in a bowl, add hummus, and mix it all up. The hummus acts as a sauce and makes everything deeelicious! Keep it simple. Make sure you get fresh veggies (farmer’s markets are the best!). I like to roast them with a little bit of olive oil and good quality salt; quick stir fry so they stay crunchy or eat them raw in salads: I love a kale, shredded carrots, raisins, feta or goat cheese and olive oil, lemon dressing…the only way my husband will eat raw kale : ) Also roasted beets are really yummy and my friend made brownies with them one time and I would have never guessed I was eating beet brownies! When my boy was 2, I would take him to the farmer’s market and was always amazed at what he was willing to try as I was buying stuff. Keep it simple and fresh! I make healthy food taste delicious by trying different spices and cooking styles. One of my favorite veggie tricks is to buy a steamer bag of green beans, steam them in the microwave, then saute in olive oil and spices to add flavor. Saves time and tastes delicious! I use coconut oil when a recipe calls for oil. I try to have veggies cut up and use homemade ranch to eat with them. I also love having fresh fruit around as well. Smoothies are our favorite way to make healthy foods even more delicious! We love adding spinach, hemp seed and bee pollen to up the nutritionals! I also believe in roasting all the veggies. Yes, the steam-in-a-bag veggies are convenient but, taste-wise, there is no comparison, to me, to oven-roasted veggies. Or grilled veggies–once it gets warmer! Roasting veggies is definitely one of my go-tos as well, and I’ve recently loved roasted veggie salads. Warm, roasted carrots can make spinach salad even more delicious, especially if you add some feta cheese and pistachios too! Honestly I love to add a little ranch dressing to a lot of foods to make them taste better. I am a big fan of grilling. Veggies, meat, fish, everything tastes better on the grill. I grow my own veggies and herbs and freeze throughout the season so I have homemade pasta sauce, peppers for eggs and soups, etc. and pesto year round! I’m a big fan of roasting veggies. Another secret is to use less oil but up the seasonings. We love nutritional yeast gravy and yeast sprinkled on popcorn! Roasting veggies brings out the natural sweetness, I especially love the flavor when I roast them with coconut or avocado oil. I also love making egg salad using greek yogurt and hummus instead of mayo. Plain Yogurt in place of sour cream usually works well. I also add a lot of spices and herbs to things to add some zip. I agree with roasting veggies…we do it almost every night! I also add veggies to my scrambled eggs each morning to make sure I get all my servings for the day. This is so great. I have found that when I keep things simple I enjoy them more. I do love seasonings though, fresh herbs and garlic and earth balance! I also like to switch cooking methods up as well. Variety is so helpful! Great tips! I love roasting all.the.things! Also adding fresh herbs helps add a fresh flavor to things! Citrus on and in just about everything–lemon, limes and oranges are my favs. Grilling is great and jalapeño poppers on the grill are the bomb. Citrus in and on everything and grilling. Jalepino poppers on the grill are the bomb. I add garlic to literally everything… 😉 But also agree roasting veggies is the way to go! I am probably the strangest person ever but I really enjoy my vegetables to be simply steamed. I don’t like too many spices. BUT I do love my mom’s baked carrot casserole that she makes at Christmas. It definitely isn’t the healthiest dish ever BUT I love it! Are there any vegetables that you just don’t enjoy? I agree with you, roasting veggies has completely changed my opinion on a lot of foods especially a lot of types of squashes!